Fipronil (CAS no. : 120068-37-3). Features: 1) Technical and formulation: 95% technical, 80% WDG. 2) Chemical name: 5-amino-[2,6-dichloro-4-(trifluoromethyl)phenyl]-4-[(1R,S)-(trifluoromethyl)sulfinyl]-1H-pyrazole-3-carbonitrile 3) Molecular formula: C12H4Cl2F6N4OS. 4) Molecular weight: 437.15. 5) Physical and chemical properties: a) Technical is white powder ; b) MP is 195.5 - 203oC, VP is 3.7 x 10-7Pa. The solubility is 1.9mg/L in water, 54.6g/100ml in acetone, 2.23g/100ml in methylene chloride, 0.003g/100ml in ethane, 13.75g/100ml in methanol, and 0.3g/ml in toluene. 6) Applications: control of multiple species of thrips on a broad range of crops by foliar, soil or seed treatment; control of corn rootworm, wireworms and termites by soil treatment in maize; control of boll weevil and plant bugs on cotton, diamond-back moth on crucifers, Coloradan potato beetle on potatoes by foliar application; control of stem borers, leaf miners, plant hoppers, leaf folder / rollers and weevils in rice; control of aphids, leafhoppers, and lice. 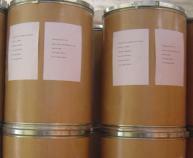 Our company is specialized exporter, manufacturer and supplier of Fipronil in China. Company: Shanghai Forever Chemical Co., Ltd.